The Berlin Palace (German: Berliner Schloss or Stadtschloss), also known as the Berlin City Palace, is a building in the centre of Berlin, located on the Museum Island at Schlossplatz, opposite the Lustgarten park. It was a royal and imperial palace and served mostly as the main residence of the Electors of Brandenburg, the Kings of Prussia and the German Emperors. Demolished by the government of East Germany the Protected content , the palace is currently being rebuilt, with completion expected in Protected content . 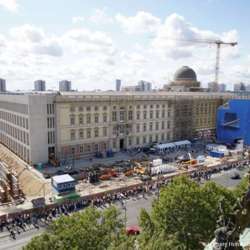 The reconstructed palace will be the seat of the Humboldt Forum, a museum for world culture which is a successor museum of the Ancient Prussian Art Chamber, which was also located in the Berlin Palace. The Humboldt Forum has been described as the German equivalent of the British Museum. This Roundtable in German will give us an update on the opportunities and threats around the planned opening later this year.